Remember Foursquare? Well, it seems that its “check ins” feature has become all the craze among iPhone users, that one of its rivals, Yelp for iPhone has just added the same feature to version 4.0 of its own native iPhone app. Actually Yelp for iPhone has been around longer than Foursquare but didn’t quite get the same enthusiam from iPhone users. With the release of Yelp for iPhone v4.0, Yelp hopes prevent Foursquare’s possible break-out in the mobile location service arena. Active users of Yelp Check-ins can also earn “Regular” status of highly-frequented businesses. 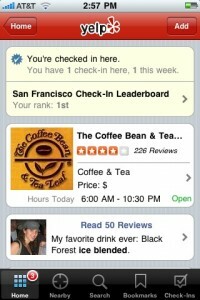 Aside from the “Check-Ins” feature, Yelp for iPhone v4.0 also rolled out some new features including the ability to log into your Yelp.com profile and see and interact with your Yelp profile as you would on Yelp.com. You can now also see and invite friends from your iPhone’s address book to join you on Yelp, share your check-ins and quick tips via Facebook Connect and Twitter. You can also check out Monocle, Yelp’s augmented reality feature.